There are always so many great activities you can do in the winter. Animals in winter have always been one of my favorite. Today I have two new themed packs. You have a Preschool and Tot Pack and PreK & Kindergarten Pack. Both are full of fun activities with a mix of hands-on and no-prep activities. I have put a wide range of activities for each of the packs. Plus some of our favorite parts of the packs to have. The Preschool and Tot pack has a collection of beginning activities for kids. There is a mix of hands-on and no-prep that match up. You have prewriting, matching, which is different, ABCs, numbers, shapes and more. The PreK and Kindergarten pack has activities for kids that are slightly older and working on different learning skills. You have different prewriting, matching, patterns, ABCs, numbers, addition, subtraction, CVC words and more. You are going to find sets of prewriting pages. Each of the pages has a solid line or a thin line that you only trace one type of line on each page. There is also a shape tracing page that comes in the same solid or thin line. You will find some matching worksheets and clip cards for ideas like which is different and big & small. This allows you to pick the needs of what you are looking for. There are two types of puzzles in the set 2 piece puzzles and 9 piece puzzles. The 9 piece puzzles also come with a mat to build the puzzle on. There are two different books in the set. You can color the bird different colors and read about the shapes that the owl is in. There is a mix of ABC sorting, dot marker, and tracing in the set. You will also find a few number no-prep pages for kids to work on. They work on numbers 1 to 10. These are just a few of the 130 pages in the set! The pack has some of the favorites like prewriting with animals, which is different, and work on patterns! There are a few fun ABC activities you can do with puzzles, cut and paste, beginning sound clip cards and coloring pages. You have animals word cards with writing, tracing and reading. You can also find those words in an easy reader book about seeing winter animals. This set has some CVC activities with a hands-on paw print matching with a matching worksheet and no-prep printables that work on -at, -et, -it, -ot, and -ut. You will find some fun addition and subtraction printables. There are single pages and a hands-on matching activity for addition. There are several counting activities you can do that work from 1 to 10. You also have missing numbers, skip counting for 5 & 10, puzzles and more! These are just a few of 145 the pages in the set! 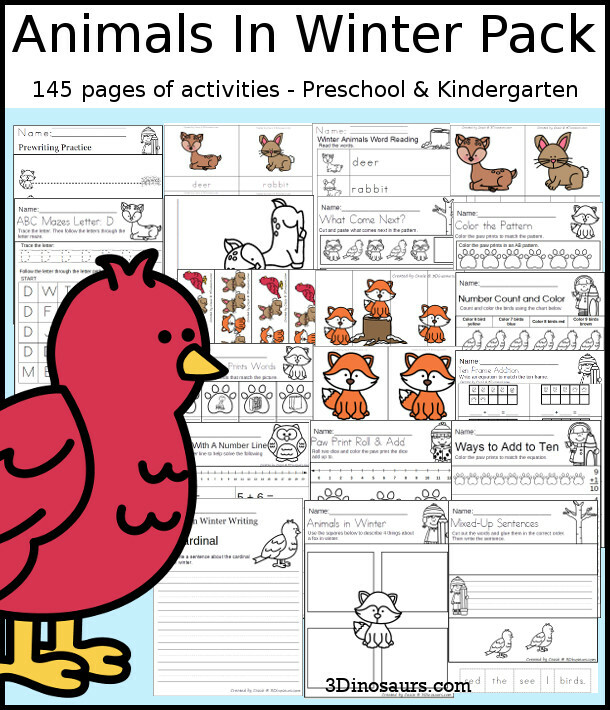 The Animals In Winter Pack for PreK & Kindergarten has loads of activities for PreK and Kindergarten age kids. There are ABCs, numbers, shapes, puzzles, easy reader book, CVC, addition, and more. It has activities that all work well together for different types of learning. There is a mix of different activities for kids to do. I wanted to have a fun mix of no-prep with hands-on activities. 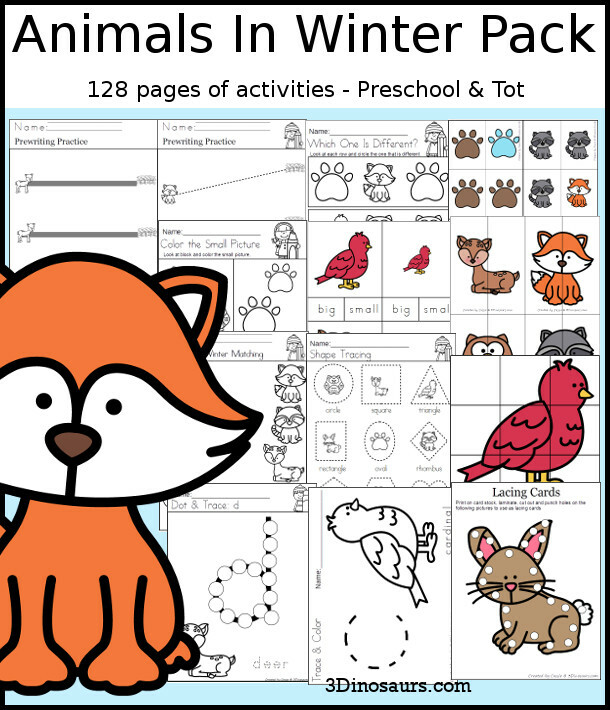 The Animals In Winter Pack for Preschool & Tot has loads of activities for PreK and Kindergarten age kids. There are prewriting pages, shapes, numbers, ABCs, counting, lacing cards, and more. It has activities that all work well together for different types of learning. The pack has activities that are no-prep and hands-on. It is a fun mix that works well together. This entry was posted in printable pack, store and tagged kindergaten, prek, preschool, printables, tot, tpt, winter animals. Bookmark the permalink.